Bring a pot of water to a boil, large enough to process four pint jars. Gently heat your lids. 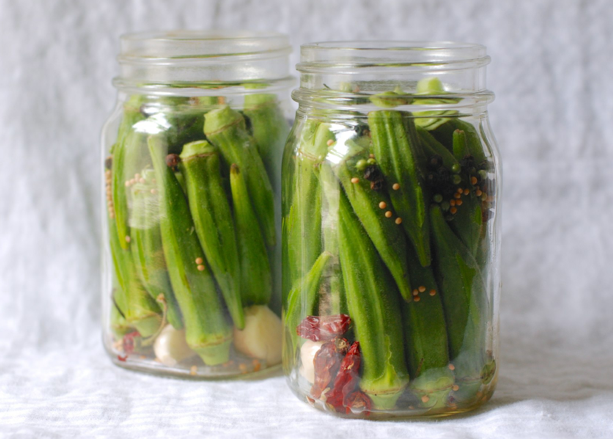 Divide the okra pods between the pint jars. Add 1/2 tsp each black peppercorns, coriander seed and mustard seed to each jar. Add two cloves and 3 chiles to each jar. Bring the rice wine vinegar and water to a boil, then add the sugar and salt, stirring to dissolve. Pour the hot brine into the okra-filled jars, leaving a 1/2 inch headroom. Wipe the rims, then add the lids. Process the jars in rapidly boiling water for 10 minutes. Try to let these store for at least two month before eating. They get spicier with age, just like my Dad. Makes 4 pints.